A group of AI experts from The University of Nottingham and Kingston University managed to create a new method by which two-dimensional images of faces can be converted into 3D using machine learning. The researchers trained a convolutional neural-network to perform the task by feeding it tons of data on people’s faces. From there it figured out how to guess what a new face looks like from an previously unseen pic, including parts that it can’t see in the photograph. The 3D computer vision project really has to be seen to be believed, and you can try it out in a nifty demo here. The website doesn’t really do the full technology justice, but it’s bloody cool. Members of the team, which consists of Aaron S. Jackson, Adrian Bulat, Vasileios Argyriou, and Georgios Tzimiropoulos, will be presenting their work next month at the International Conference on Computer Vision in Venice. The website demonstrating it was a quick mashup over the course of a few evenings. I basically made it because I thought seeing yourself in 3D is fun. A lot of research in computer vision is hard to present in a fun way because it’s things like new methods for detecting points on a face. 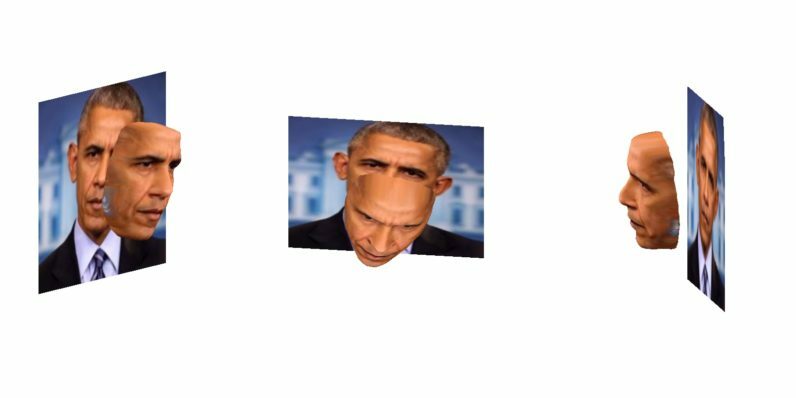 An AI that can turn pictures into faces is the tip of the iceberg here. The implications go far beyond amusing technology journalists for hours at a time with a website. In reality computer vision is one of the most useful purposes for deep learning and we can’t wait to see what Jackson and his fellow developers do next.